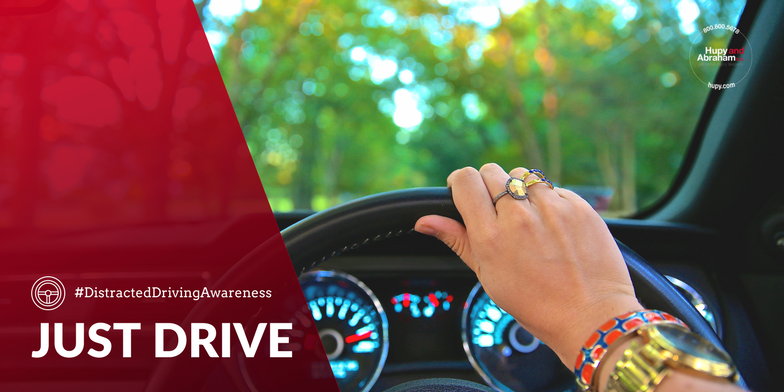 Just Drive to Avoid Distracted Driving Accidents | Hupy and Abraham, S.C.
That’s the message that the National Safety Council wants you to hear during Distracted Driving Awareness Month, and that’s what it wants you to do every single time you are behind the wheel. The message is simple, but the reality of focusing exclusively on driving is much more difficult. Can you avoid the temptations of your cell phone, GPS, and music system? Can your friends and relatives do that? Can other drivers be trusted to do the same? Sharing information from the National Safety Council on social media with the hashtag #JustDrive. You can find compelling infographics and other information to share on Facebook and Twitter on the National Safety Council website. Joining Thunderclap at 8 A.M. Central time on Monday, April 2, 2018. Thunderclap is a special social media campaign that will get the #JustDrive hashtag trending. Joining a free webinar, Engaging Ways to Address Distracted Driving at Work, on Thursday, April 19, at 11 A.M. Central time. Car crashes are the number-one cause of workplace deaths, and avoiding distracted driving accidents may help prevent some of these fatalities. Taking the pledge to stop distracted driving. You can find a pledge on the National Safety Council website, or you can create your own with your family or coworkers. April is distracted driving month, but distracted driving is a problem that continues throughout the year. Don’t let your focus on concentrated driving end on April 30. Instead, take this time to change your habits, to become a safer driver, and to encourage others to do the same. You can get started now by sharing this article on Facebook or Twitter so that others can find out more about the dangers of distracted driving. If you’ve been hurt by a distracted driver already, then you can also take action by contacting our experienced distracted driving lawyers for a free and confidential consultation about your rights. Contact us online or call us directly at 800.800.5678.